We have great gifts for your grads!! It is SPRING CLEANING Time! 15% OFF DESIGNER JEWELRY (Items must be in stock) CLICK HERE! Buying for 3 or more? These gifts aren't just for groomsmen! When you buy 3 or more you receive 15% off of these items. One of a kind gifts for the one of a kind special someone in your life! One of a kind CUSTOM gifts for your one of a kind Special Someone! 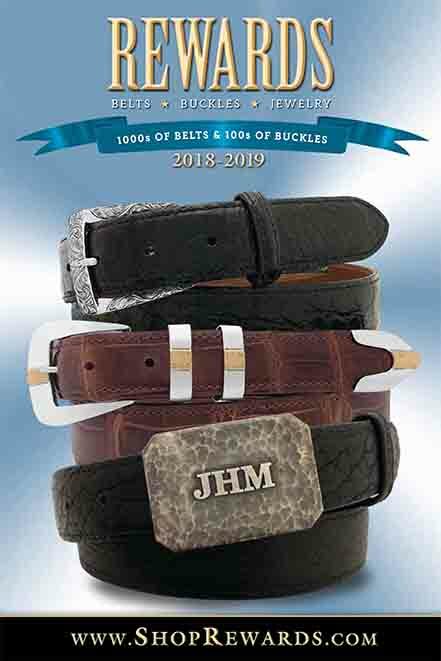 These beautiful belts come in all colors, shapes, sizes and skins to complement your unique buckle! BRACELETS, RINGS, AND NECKLACES OH MY! That's not all though, we also have a selection of beautiful earrings on our woman's jewelry page. Don't forget to check out our close out items as well, we have Story Wheels and Angels with Attitudes 50-60% off! WE MOVED-The new showroom in Dallas is located at 4230 Lyndon B Johnson Fwy, Suite 163 (near the SE corner of LBJ Freeway and Midway Rd-Enter through the main entrance and turn left down the first hallway). The hours are Monday through Friday, 10AM to 5PM, and by appointment. You can still shop with confidence knowing that we will continue to stand behind our products and provide Rewards' special service. If you have questions or would prefer to order by telephone, please call 1-800-292-0195 Monday through Friday, 10AM to 5PM CST and a real person will be glad to help. REWARDS values you as a customer. Here is our promise to you.